The EIP CD35P compact unit, is surprisingly quite, yet have the features of many larger models. They are rugged enough for industrial shops and storerooms in additional to residential work. Their attractive appearance makes them suitable for home den, basement or garage applications.The CD35P is self contained with an automatic condensate pump; making it the ideal choice for the rental environment or water damage and restoration jobs for unattended, low maintenance installation is required. 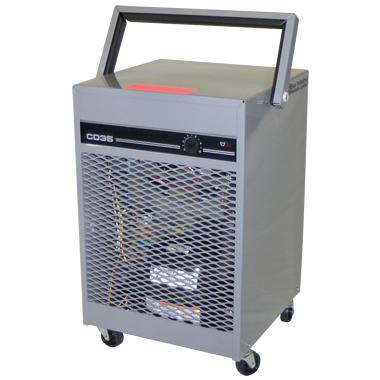 The EIP CD35 dehumidifier is a compact, stand alone unit which provides quiet, maintenance free service in extreme environments, without the cost, and irritation of coil freeze-up. This simple, yet effective solution is ideal for a damp basement or clammy locker rooms it can be is easily transported to the problem area, and goes quietly to work. Excess humidity in your crawl space, warehouse, office factory or shop results in corrosion, mold growth and rotting. Enormous costs are incurred every year through damage to inventory and through inflated building maintenance costs as a result of dampness. Even if your building seems dry during the day, at night when the temperature falls the humidity rises and the condensation process begins. The compact physical size, and high performance, makes the CD35 family the ideal choice for many applications.